By name alone, you might think that the Lucky Darts slot machine from Microgaming would be a unique one. When you open it, you'll quickly discover that you were right! 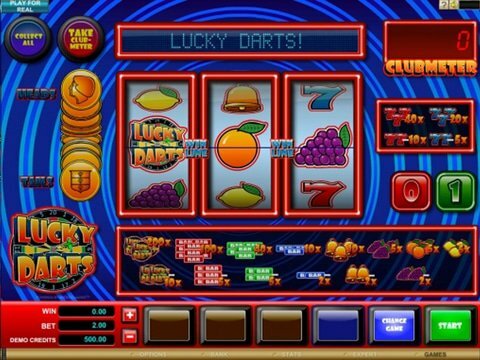 You can review it right here on this page with the Lucky Darts free play slot demo that's available with no download and no registration. Because it's also accessible from most modern mobile devices, you can even play it while you're on the go if you just need to pass the time. The graphics are clear but plain, and they're made up mostly of what you'd expect - fruits, bells, 7s, and the Title Logo, of course. There are a couple of unique things that are going on here, though, and perhaps the most exciting is the Club Meter that fills to ward issues. Random holds and win spins are also nice, and if you manage to trigger the Bonus Game with three darts on the screen, you can get a chance to throw bulls-eyes with a multiplier that tops out at 3000x! If the Heads/Tails on the left lights up, you can even gamble your winnings by simply guessing how the coin is going to land. If you're in the mood for something that's a little less complicated in your real money gambling endeavors, then the Magnificent 777s slot, which is also from Microgaming, is a great choice. This one is based on the story of the Magnificent 7, and it gives you the opportunity to win up to $200 in a single spin with a maximum bet of $10. The multipliers appear with the sheriff's badges, and you can reach up to 550x per spin whenever you see the gold badge. There's definitely a lot to win in this simple machine, so you'll probably like this one better if you're in the mood to relax.